Today’s digital workplace seems to be very app-centric. Organizations use lots of different tools for document and data storage, collaboration, and communications. Oftentimes users must log in to several separate, disparate systems in order to find the information they need to do their jobs. Digital workers are not thinking in terms of apps, however, but rather about topics or areas of focus like customers, projects, products, events, or services. Jumping back and forth from one app to another trying to piece together related information can be a huge productivity (and sanity) killer. You may already be aware of the solutions that harmon.ie has created to solve many of the productivity issues that workers may deal with on a daily basis (if not you can see a couple previous times I wrote about it here and here). 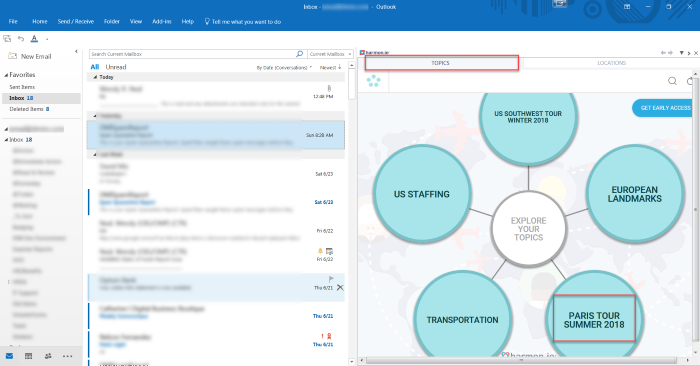 harmon.ie recently introduced their latest product, harmon.ie 10, which adds a new Topics tab to their harmon.ie for Outlook sidebar that helps users further focus on what matters most. The new harmon.ie 10 extracts topics from your emails and uses Microsoft’s Graph search engine scoring algorithms to find and display the 5 topics most relevant to you. 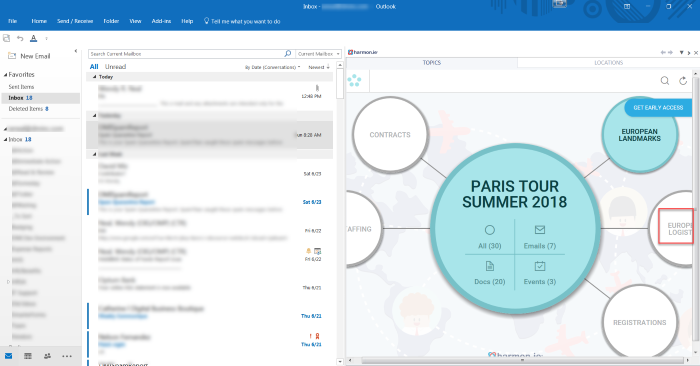 It also gathers all related information from your integrated apps, such as SharePoint, OneDrive and Teams documents, as well as email messages and events, so you don’t have to search for them. For each topic, you can click on it and further drill down to see the top 5 related subtopics, and so on. Rather than you having to flip through multiple apps to find all the relevant subtopics and information, it’s all rolled up nicely for you in an interactive graph view. You can open documents, emails, and calendar events right from the sidebar, without ever leaving Outlook. I got to take a sneak peek at the new features of harmon.ie 10 to test it out and offer my feedback. One thing to note is that the Topics tab only supports Office 365, not SharePoint on premises. The harmon.ie 10 sidebar for Outlook now includes a brand new Topics tab that allows me to see the top 5 topics that my colleagues and I are currently collaborating about. For the following example, imagine I am a tour manager and I am organizing several tours across the world. From the topics tab I can see information about some upcoming tours that I am leading. The 5 topics that are most relevant to me happen to be US Southwest Tour Winter 2018, European Landmarks, Paris Tour Summer 2018, Transportation, and US Staffing. Since the Paris tour is coming up this summer, I want to focus on this today. I can click on Paris Tour Summer 2018 to see its related topics. These subtopics will help me better understand what to focus on. Now I can see all the subtopics related to the Paris tour. I can also see a summary of all the artifacts related to the Paris tour in the large circle in the middle. It’s telling me that there are 30 artifacts, including 7 email messages, 20 documents, and 3 events pertinent to the Paris tour. 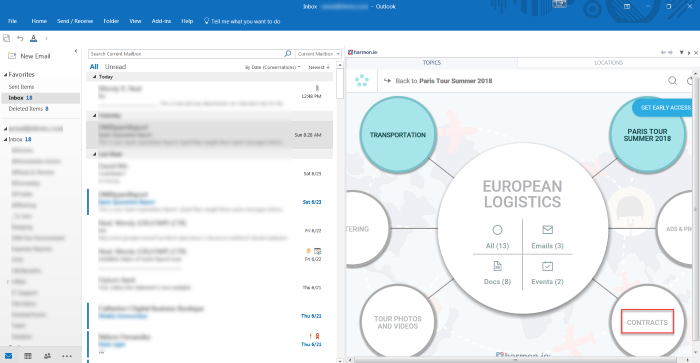 Today I need to handle the European logistics for the Paris tour, so I click on the European Logistics circle. 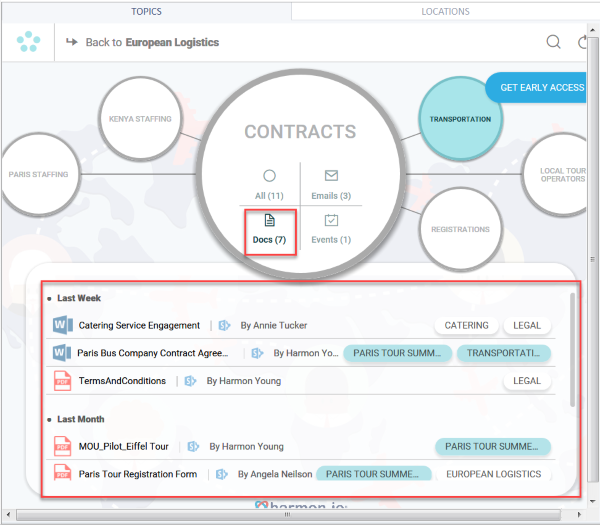 As I’m working on the logistics, I am reminded that I need to work on some supplier contracts because that topic shows up on my graph, so I click on Contracts. 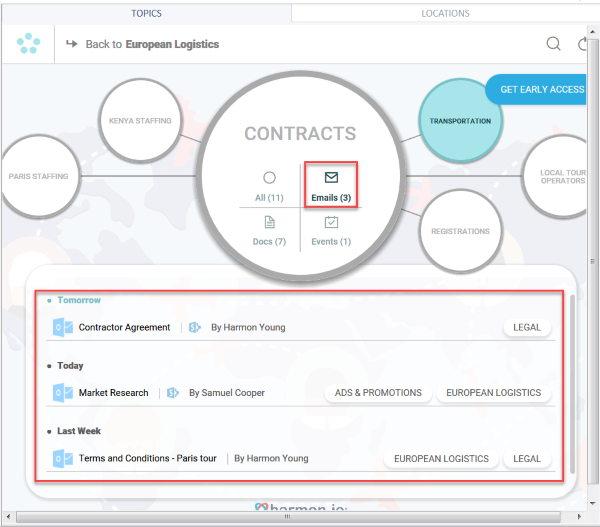 With this and all topics, you can click on the links below the topic name in the center circle to see a summary view of all related artifacts. The following screenshots are trimmed and only show the harmon.ie sidebar (vs. the entire Outlook window) for easier viewing. I can click on each artifact type separately to filter out the different types. 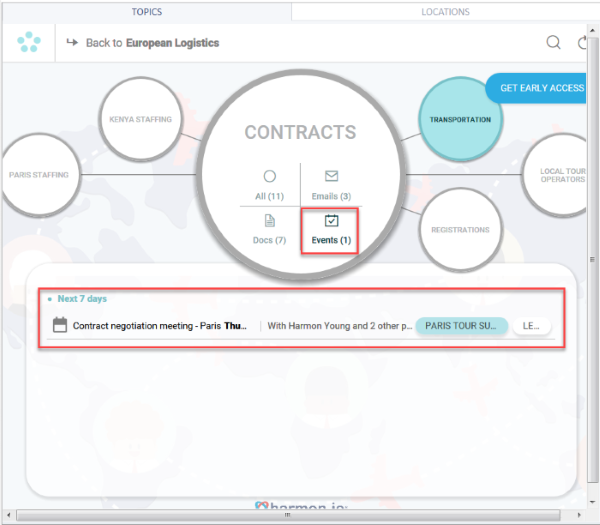 For example, clicking on Events will show me all meetings related to Contracts. Likewise, clicking on Emails will show me all emails related to Contracts. And… clicking on Docs will show me all the documents related to Contracts. These could be located anywhere in SharePoint, OneDrive, or Teams. They are all rolled up nicely however, in this single view so I don’t have to go searching for them. 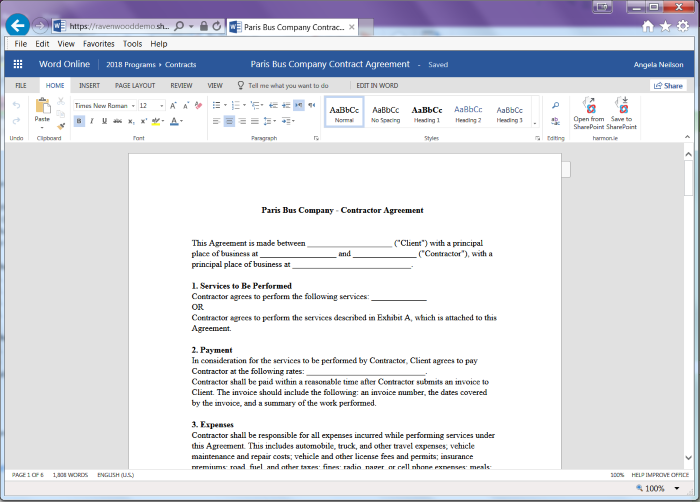 Double-clicking on a document will open it up. In this case, I’ve opened the Paris Bus Company Contractor Agreement. It opens in Word Online, which allows me to make changes if I need to and then save it right back to the location it was opened from seamlessly. The coolest thing to me about harmon.ie 10’s topic view is that instead of searching for information related to a particular topic, all the relevant information is delivered directly to me all rolled up. It also allows me to discover information that may be interesting to me that I would not have even known to search for, because I didn’t know it was there. Emails, documents, and calendar events around a certain topic are only a click or two away. I can view documents, emails, and events by clicking on them from within the Outlook sidebar, instead of trying to find them in their native location in Office 365. If you’ve already invested in Office 365, you may not be getting the complete value out of your investment. I’m guessing not many organizations are taking advantage of the Microsoft graph as much as they could be. harmon.ie 10 can help you get your money’s worth by presenting your information to your employees in a more meaningful way, which can lead to increased worker productivity. Currently harmon.ie is opening up early access for a few select organizations that are currently using Office 365. To see if you are eligible and to request early access, fill out the Early Access Program Form.